Most of the studies of snakes in Nepal are concentrated to analyze the annual snakebite incidences, morbidity, mortality and case fatality rate; mainly in the Terai region. This project will undertake an array of educational initiatives on snake conservation, targeted at the local and national levels which will have direct beneficial impact on more than 80 snake species in the country.To achieve the aims, one district level snake conservation workshop, 25 snake conservation awareness camps, four workshops in communities and four radio programs will be conducted. 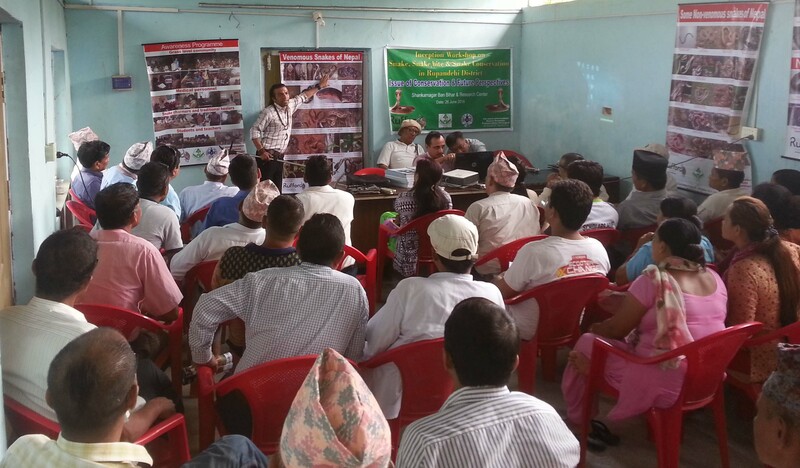 With support from Save The Snakes, Kamal and his team will establish a snake rescue centre and four snake information centres in the Rupandehi District. They plan to distribute snake tongs and train community members to rescue and relocate snakes. They will produce and distribute snake conservation related educational materials. This project will create conducive working environment among local people from different sectors to save snakes and to save nature directly and indirectly throughout the project using multitude of communication, education and public awareness tools. These initiatives may help to spread the knowledge on advantages of conservation of snakes to biodiversity which can play an important role in nature conservation. Please donate today to help us continue to fund projects like Kamal’s snake conservation project in Nepal. Save The Snakes depends on the assistance of generous people like you to help fund international snake conservation efforts. Thank you for your support.